A new version 4.23 of the XPLAN_ASH utility is available for download. This version comes only with minor changes, see the change log below. - Finally corrected the very old and wrong description of "wait times" in the script comments, where it was talking about "in-flight" wait events but that is not correct. ASH performs a "fix-up" of the last 255 samples or so and updates them with the time waited, so these wait events are not "in-flight"
It's probably not that well known that Oracle can actually rollback / re-start the execution of a DML statement should the cursor become invalidated. By rollback / re-start I mean that Oracle actually performs a statement level rollback (so any modification already performed by that statement until that point gets rolled back), performs another optimization phase of the statement on re-start (due to the invalidation) and begins the execution of the statement from scratch. A new version 4.22 of the XPLAN_ASH utility is available for download. This version primarily addresses an issue with 12c - if the HIST mode got used to pull ASH information from AWR in 12c it turned out that Oracle forgot to add the new "DELTA_READ_MEM_BYTES" columns to DBA_HIST_ACTIVE_SESS_HISTORY - although it got officially added to V$ACTIVE_SESSION_HISTORY in 12c. So now I had to implement several additional if/then/else constructs to the script to handle this inconsistency. It's the first time that the HIST view doesn't seem to reflect all columns from the V$ view - very likely an oversight rather than by design I assume. The database engine determines the maximum disk I/O size used during multiblock reads (for example, full table scans or index fast full scans) by multiplying the values of the db_block_size and db_file_multiblock_read_count initialization parameters. 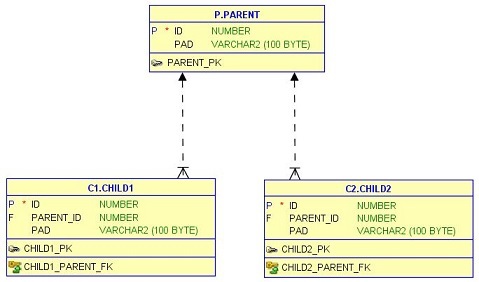 The db_file_multiblock_read_count initialization parameter can be set explicitly, or, as of version 10.2, it’s also possible to instruct the database engine to automatically configure it. For the latter, simply don’t set it. In this post I would like to describe a behavior of Oracle Database that, at least for me, isn’t obvious at all. Actually, it’s something that I can’t explain why it works in that way. Let’s start by setting the scene by describing the schema I’m using for the following tests. As you can see from the image, there are three tables: one table (PARENT) that is referenced by two other tables (CHILD1 and CHILD2). In my case every table is owned by a different schema (P, C1 and C2 respectively). But, the behavior I describe is independent from that fact (i.e. it works in the same way if all tables are owned by the same schema). If you are interested, here is the SQL*Plus script I used to create them.